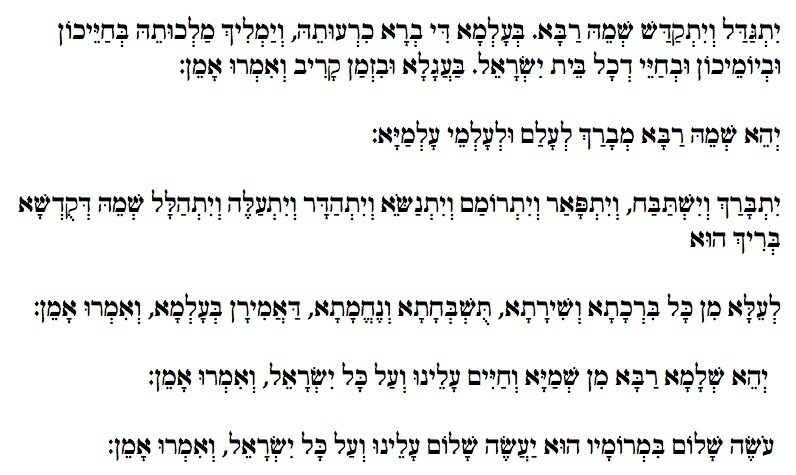 Much could be (and has been) written about the Kaddish (to which I have put links below). Although one version is referred to as mourner’s kaddish, it is part of our daily prayers, and comes, in some form, in almost every service. It is, above all, a prayer in praise of life. At the very end of Yom Kippur, we sing a lively melody for it, but at most other times in the liturgical week and year, the music is much more intense and inward. My musical setting is intended to emphasise the vitality and excitement that I feel is inherent in the words. uv’chayei di chol beit yisrael. Ba’agala uvizman kariv v’im’ru: amein. v’nechemata, da’amiran b’al’ma, v’im’ru amein. 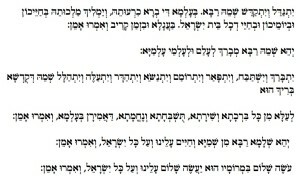 v’chayim aleinu v’al kol yisrael, v’im’ru amein. throughout the world which He has created according to His will. speedily and soon; and let us say, Amen. Forever, throughout all time, on to all eternity. and consolations, that are ever spoken in the world; and let us say, Amen. and life, for us and for all Israel; and let us say, Amen. Ravel, Maurice (musical setting) – 1) sung by José van Dam 2) sung by Monserrat Caballé 3) violin and piano 4) sung by Cantor Azi Schwartz.